Having started running early on, I ran every sprint and middle distance on the track from the 60m to the 3,000m. My strength was definitely in the longer distances! In road races, I’ve run the 5km, 5mile, 10km, 12km, 8 mile, half marathon, and full marathon. I’ve also completed two half iron distance triathlons and four Ironmans. Get back into shape post-baby, build strength, prevent injury, and have fun! I completed in Bloomsday nine times. I haven’t been since 2005 and really want to go again in the next couple years. I ran this twice and loved the race…probably because it’s in the tropics of Hawaii! 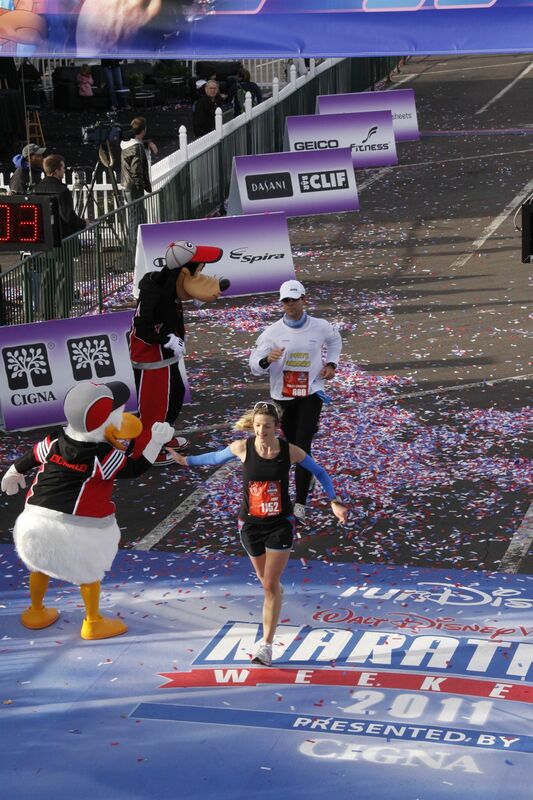 I’ll always remember the shock after my first half marathon when I wasn’t too tired at the finish line. I had no idea about my pace and could have run so much faster! It was a really small race, and I can’t even remember the name of it. This was Kelly’s and my first marathon in 2004, its inaugural year. It hurt like crazy, but it was so much fun to do together. You can’t beat the bands and cheerleaders lining the course! On our honeymoon there happened to be a run for the cure, so we signed up for it the day before. After three weeks of indulgences, it wasn’t a good competition but being able to run on our honeymoon was so special. This was my last stand-alone marathon. I couldn’t run for three of the seven weeks we had to prepare for it. I was hurting up until the day before the race. Magically, I was totally fine on race day and not only had a blast but also had a great finishing time. I loved the Disney race and would recommend it to anyone! This was my first triathlon. A half Ironman consists of a 1.9km swim, 90km bike ride, and 21.1 km run. This bike was 94 km. I was a nervous wreck leading up to it, but truly enjoyed nearly every single minute of the day. I was awed that I swam without panicking, biked all the hills without getting too tired, and ran my way to a 1:42 half marathon, finishing in 5.27.55. Although I had finished one triathlon, I wondered what I got myself into the days before this race! An Ironman consists of a 3.8km swim, 180km bike ride, and 42.2 km run. One of my lifetime favourite memories is right before the start of this race. We were in the dark waiting to jump into Tempe Town Lake when we spotted our parents and my sister, brother-in-law, and niece up on a bridge. Kelly and I jumped in and treaded water for 10 minutes prior to the start just taking in the music, nerves, and energy. Although freezing, I was ecstatic I finished the mass start swim relatively unscathed. I nearly cried tears of joy finishing the bike after major winds picked up. Approaching the run/race finish, I went into a weird state—high-fiving everyone, not seeing anyone, and not hearing anything including Mike Reilly announcing that after 12 hours, 12 minutes, and 19 seconds I. Was. An. Ironman. Wow Abby you are going to do CDA and Canada this year. I’m so burnt out after 1 IM in a season I just can’t imagine doing 2 in the same year! Looks like you have a great training partner though! 🙂 Are you going to try and qualify for Kona? You are probably in a good position and good AG to try for it?! Finishing two will definitely be a test for me! I am so lucky to train with my hubby. Qualifying for Kona has never been a goal of mine. I love to do Ironmans for fun, and I like not taking my training too seriously. I’d have to work A LOT harder to even come close to qualifying. I’d love to go watch it one year though! So glad I found your blog! I am doing my first ever triathlon tomorrow (olympic distance) and am pretty terrified! My ultimate goal is to do a half iron then a full within the next 5 years. Your blog gives me inspiration! Thanks for stopping by Kate! Wow- I hope the race went well!! Let me know! Oh- tough one! I loved Arizona since it was my first, but the other courses were a lot more interesting! I’m going to contact you through your blog!